The Dutch artist Piet Mondrian (1872-1944) was a pioneer in abstract paintings. Each painting was worked and reworked, built layer by layer toward an equilibrium of form, color, and surface. Mondrian named his style "neoplasticism." That is how he translated his own Dutch phrase nieuwe beelding, which also means "new form" or "new image." The style was based, he explained, on an absolute harmony of straight lines and pure colors underlying the visible world. 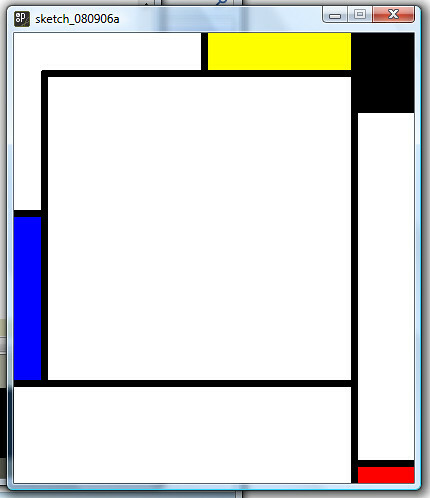 This consisted of a grid of vertical and horizontal black lines and the use of the three primary colours.[http://en.wikipedia.org/wiki/Piet_Mondrian. 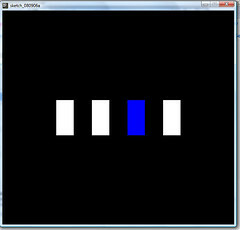 Using Processing Language, a programming language and (I.D.E.) integrated development environment for visual design, we can learn the basics of programming in a visual context, and to serve as the foundation for electronic sketchbooks. We were introduced to the Arduino microprocessor. Arduino is an open-source electronics prototyping platform based on flexible hardware and software. Used by designersit helps in creating interactive objects or environments. Being a platform based on a simple I/O board and an I.D.E, it's used to develop independant interactions, connected to computer software. Our assignment was to burn a program onto the microprocessor and to make a LED blink on the circuit board.